Copenhagenize.com - Bicycle Urbanism by Design: Update: What if Car Commercials Reflected Reality? Update: What if Car Commercials Reflected Reality? 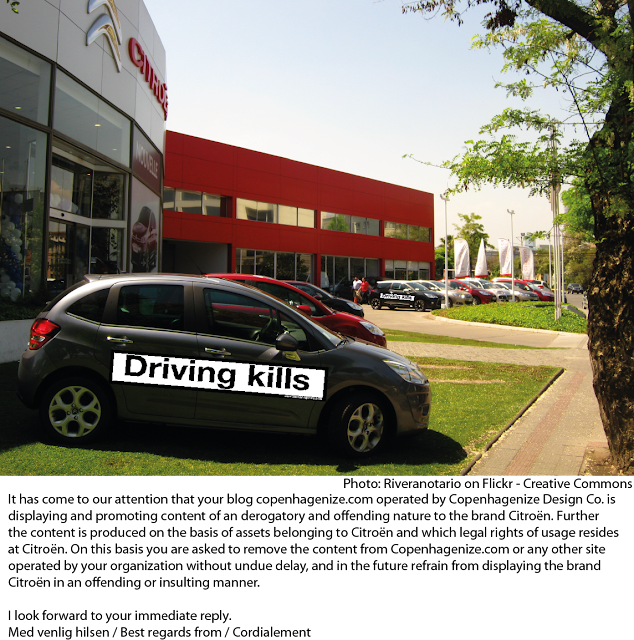 Should car manufacturers be forced to include health warnings on their products? Read about that idea here. Yesterday, two gentleman from Citroën Denmark knocked on the door. In Danish, a sudden, unannounced visit is called "fransk visit" or French visit, so that was appropriate. They were from the marketing department and they wanted to discuss, of course, the parody commercial that we had whipped together to highlight the fact that car commercials never reflect reality or fact. We weren't suprised to hear from Citroën, but their personal visit was an interesting twist. A good, strategic move in a social media age where sober Cease & Desist letters get blogged in 4 seconds. I invited them in, of course, and we had a pleasant chat on the sofa. They wanted, of course, the parody commercial removed. No surprise. They were sent from headquarters in Paris, who saw the parody on a Turkish blog. It has come to our attention that your blog copenhagenize.com operated by Copenhagenize Design Co. is displaying and promoting content of an derogatory and offending nature to the brand Citroën. Further the content is produced on the basis of assets belonging to Citroën and which legal rights of usage resides at Citroën. On this basis you are asked to remove the content from Copenhagenize.com or any other site operated by your organization without undue delay, and in the future refrain from displaying the brand Citroën in an offending or insulting manner. I look forward to your immediate reply. That line, "displaying and promoting content of a derogatory and offending nature to the brand Citroën", is rather irrelevant. It's a brand, not an individual. We ain't crying rivers because your brand got an ouch on their finger. Turning that around, I'm sure that many of us would consider the fact that Citroën produces over 3 million cars a year, unleashing them on our city streets, could also be regarded as "derogatory and offending nature to Homo Sapiens and liveable cities". There was no particular reason that we used Citroën in the parody. They are just Big Auto to us, like all the rest. A cog in the nameless, faceless machine that plays no small part in killing 1.2 million people a year around the world, injuring 50 million, and contributing negatively to the public health. Citroën has featured in our ongoing series The Car Industry Strikes Back before. In that link you can read about a commercial they filmed in Copenhagen a couple of years ago. One of the most spectacular examples of greenwashing in recent times. Interestingly, I can't for the life of me find a copy of it on the internet. It's as though they have tried to erase all knowledge of it. At the end of the day, we decided to remove the parody from the blog. It's summer holidays after all. There is wine to be drunk, oceans to swim in. It was good fun, but hey... we can always think up other ways to have good fun. Whether or not the parody shows up on other servers elsewhere in the world is beyond our control. Nor can we control Google and their search engines because anyone could just google If Car Commercials Were Based on Fact not Fiction and find it themselves. We've removed it from "Copenhagenize.com or any other site operated by your organization". Regarding the line in the email about "in the future refrain from displaying the brand Citroën in an offending or insulting manner"... yeah, well, no guarantees there. There is a good tradition of parody gaining the backing of the courts in Denmark, but there are more important battles to be fought and won. It's no secret that car commercials are, by and large, fiction. Shiny cars roaring along empty streets devoid of traffic jams or scarring their way through impressive landscapes. Selling the dream. With the emphasis on dream. So. What if car commercials reflected the reality of life on the roads? What if they had to - or were even forced to by laws regarding advertising standards - highlight the carnage that motorists cause on the roads of the world. Here at Copenhagenize Design Co. we played around and took it the next level, producing a car commercial based in reality instead of fantasy. Ivan Conte is working with us for six months as an intern and he produced this little taste of real-life advertising.